For many years we’ve been interested in metal shaping, not only for repairing and making radiator tanks, but also for restoring old cars. 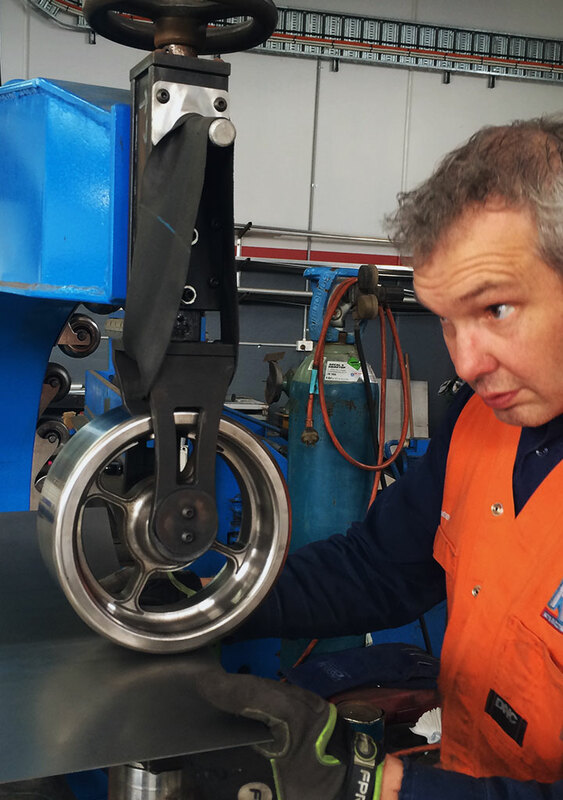 Andrew has done a few courses over the years with Peter Tommasini who has over 40 years’ experience and has made a number of complete HK to HG Monaro rear guards from a single piece. One thing is for sure, panel shaping can be one of the most frustrating tasks in the workshop, but when you get it right, it’s the most rewarding feeling. Andrew has built an English Wheel using Hoosier Profile upper and lower anvils which works extremely well. He’s also recently purchased a real Cast English Wheel that was in need of a little loving. We have a 1960-1970 Pullmax for shaping and a “Lazzie” bead roller, an assortment of shrinking and stretching tools and the good old trusty tree stump. Although this is Andrew’s passion, it has proven extremely helpful in the workshop, for example, when straightening old brass tanks before soldering. We’ve recently remanufactured the front guard for a model “T” Ford complete with side Valances and running boards. This was quite a project, when restoring the rear guards Andrew made numerous rust repair panels for those hard-to-get parts. We’re currently restoring an HD Holden windowless panel van which will one day be our daily driver and promotional vehicle – we look forward to getting this one on the road! If you have a vehicle that needs some metal shaping lovin’, from replicating cut out rusted sections so you can weld them in yourself to letting us take on the whole job. Please ring Andrew to discuss your next project.